No. 4 & 6, Jalan Utama 2/30, Maju Jaya Industrial Park, 47100 Puchong, Selangor, Malaysia. 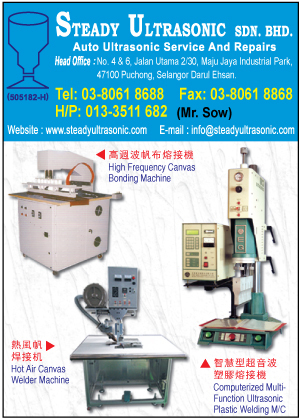 STEADY ULTRASONIC SDN BHD was incorporated on 10th February 1998 with the combined resources and expertise of two individuals, Mr Chu Kooi Fah and Mr Sow Chew Tark of Maxclean Enterprise. The main objective of the company is professional in manufacturing and producing Ultrasonic equipment widely used in various application in textile and plastic industries and non-woven fabric industries, such as: Sealing, Embossing, Slitting, Forming. All product are marketing local area and accordance to our customer's requirements.